Incorporating online marketing into your overall marketing efforts seems logical and self-evident, yet all too often companies develop two images: One developed via print (logos, brochures, POP), customer experience and reputation; Another developed online through web identity, customer reviews and social media (Facebook, twitter, etc.). This unintended consequence happens because the people in your organization who are working on your conventional advertising are not the same people working on your Internet activities. We help companies meld the two images by meeting with your primary marketing executives first, asking relevant questions and uncovering your overall marketing goals. Frequently we recommend marketing research to validate or uncover what the existing perception of your company is among your targeted audience. We may interview customers, vendors, competitors and employees to glean this information. We certainly will do Internet research that includes determining the market position, existing perceptions and untapped opportunities for your company. We believe it is possible to measure marketing results, partly based on sales, and partly based on your target market’s awareness and impression of your company. 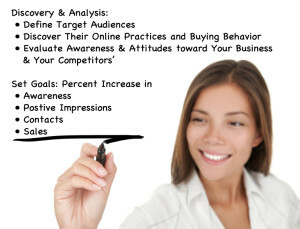 Comprehensive Internet marketing involves figuring out where you are now, setting a course based on your goals, then tracking how you are progressing toward that goal. We reward what works and discontinue what doesn’t. 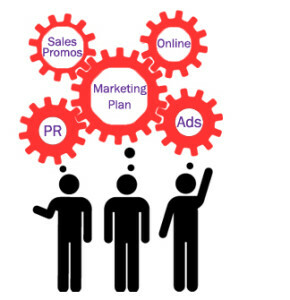 We stay in constant communication with your advertising team to ensure that we are all saying the same thing in the marketplace, presenting a holistic entity, and leveraging all your marketing efforts for increased profit and business valuation.